Where legends are born Dougie Waters loves nothing more than a weekend barbie and cricket match with his mates. But his paradise on earth is destroyed when his best mate and neighbour Norm is forced to leave town and their new boss, a pompous English administrator named Edward Lords, moves in. 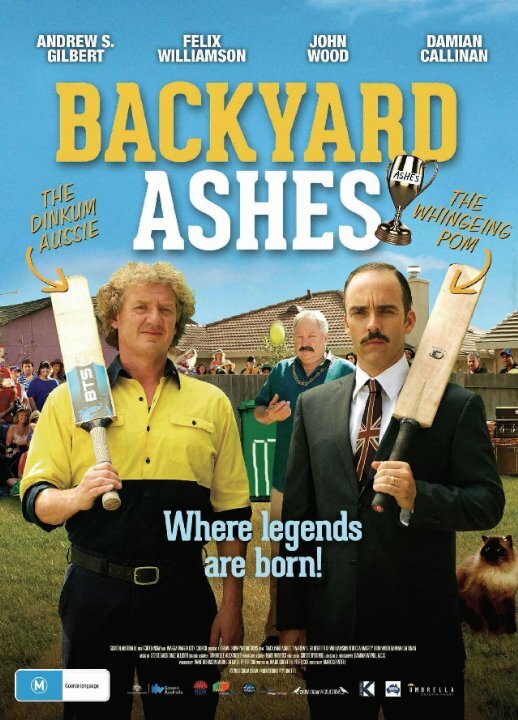 The animosity between the two peaks during one fateful backyard cricket match when Dougie hits a ball that accidentally stuns Edward’s prize winning cat, Dexter. The cat falls into the roaring BBQ and is instantly incinerated, leaving only ashes. Dougie’s son captures footage of the unfortunate event on camera and it is uploaded onto the internet where the video instantly goes viral! The idea of a backyard cricketing challenge is hatched, with the winner keeping the ashes of Edward’s deceased cat, Dexter. The two teams battle it out in the greatest game of backyard cricket ever for the Backyard Ashes. Audiences who loved Australian comedies like THE CASTLE, BODYLINE, THE NUGGET and CRACKERJACK are the same audiences will get up and scream “HOWZAT! !” when they watch BACKYARD ASHES. This entry was posted in Films on January 7, 2015 by n1ch0la5b0lt0n.